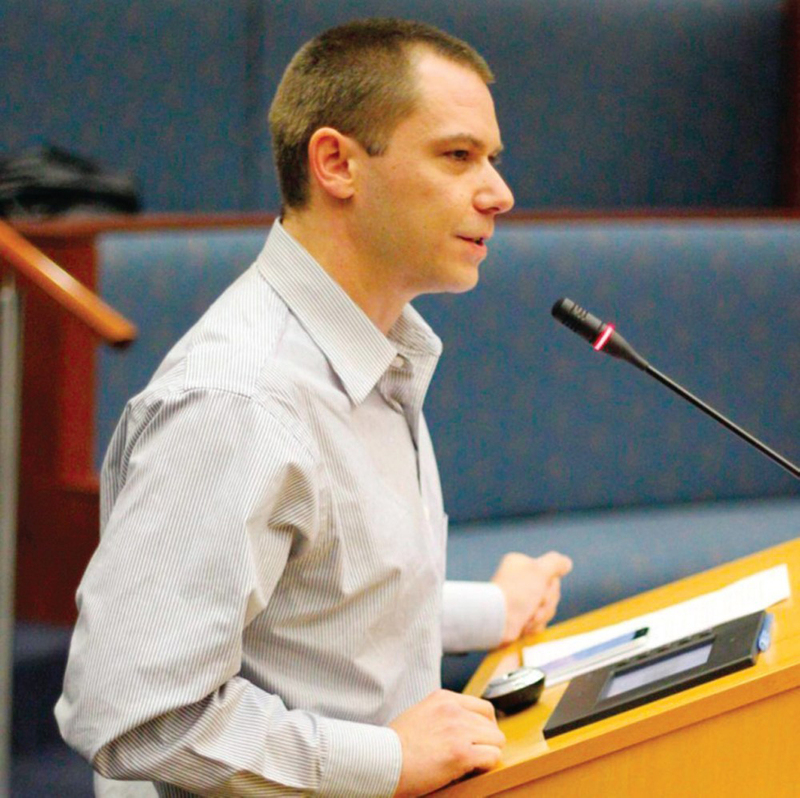 Marko Ivancicevic was one of several residents who spoke out in favour of cannabis retail shops in Oshawa. Ivancicevic, who applied for a retail license with the province, argued the city would miss out on funding to help with the implementation of legal cannabis. Oshawa is in on private retail cannabis shops. After a marathon meeting, city council voted 7-4 in favour of allowing pot shops in the city once the province rolls them out on April 1, 2019. Councillors John Gray, Rick Kerr, Tito Dante-Marimpietri, Brian Nicholson, Bob Chapman, Derek Giberson, and Mayor Dan Carter voted in favour while Councillors John Neal, Bradley Marks, Rosemary McConkey, and Jane Hurst were opposed. Council heard from a number of delegations prior to its decision, including a few individuals who have applied for a store license. Gray, who brought forth the motion to opt-in, said humans have been consuming marijuana for 6,000 years. Nicholson said the reality is marijuana is now legal, and there is nothing the city can do to change it. “The only option that is put before us is the very limited option we have. We cannot roll back the federal legislation, we cannot roll back the provincial legislation…,” Nicholson said. The Ward 5 regional councillor said the city has the chance to allow its residents to purchase a “safe, regulated product,” and he believes the majority of users want to obtain it legally. “People don’t want to risk being arrested, they don’t want to risk seeing their name on a ticket, they don’t want to risk their reputation,” Nicholson said. She said “caution is important” in such a choice, and desired to wait and see how retail cannabis stores go in other municipalities. Furthermore, McConkey questioned how much economic impact the cannabis industry would really have. Hurst said she could not support opting in because of the city’s inability to regulate the number of stores, and where they will be. Speaking in favour of opting in, Marimpietri said not allowing retail stores in the city would send a negative message to the rest of the industry, including producers. “How much more ‘no’ can we say to industry, and expect more industry to come here,” he said. Ward 3 regional councillor Bob Chapman said in the 31 years he served as a police officer he saw the negative effects of both drugs and alcohol. But the decision to vote in support came down to the fact cannabis is now legal. Ward 4 regional councillor Rick Kerr said opting out would put those who require medical marijuana in Oshawa at a disadvantage. He said many people chose medical marijuana to treat their pain and conditions as opposed to painkillers or other medications. “If there are alternative, cheaper ways for people to deal, then they should be able to get it,” Kerr observed. Kerr’s city counterpart, Derek Giberson, had gone back and forth on his decision over the past few weeks. Marko Ivancicevic is a cannabis industry consultant who has applied for a retail store license in Ontario. He noted the license lottery only considered applications for municipalities with populations greater than 50,000. Only 10 of these municipalities had opted in as of council’s decision. Ivancicevic told council if they want to kill the “black market” of marijuana, the easiest way was to opt-in to retail stores. “You need to increase the ability to purchase it legally,” he said. The former member of the city’s accessibility committee urged council that by opting in, they’d be taking advantage of provincial funding available to them. The Ford government has allocated $40 million to the Ontario Cannabis Legalization Implementation Fund (OCLIF). OCLIF will provide funding to municipalities to assist with any costs related to the legalization of recreational cannabis. The city has received notice of a per household funding allocation of $82,443, to be split within the Region of Durham. “You have the province, literally, holding out their hand. You lose that opportunity now and in the future [by opting out],” Ivancicevic said. He also argued as more municipalities choose to opt out, more money is available to those who opt-in. However, McConkey said the $82,000 amount was underwhelming to her, and it seemed difficult to estimate exactly how much provincial funding would be available. She questioned Ivancicevic why he believed the province was offering municipalities money. Ivancicevic said, in his view, with only six stores being allotted in Oshawa’s geographical region, he couldn’t see the city getting more than two retail stores at most. Gray questioned Ivancicevic on his desired locations for a store. But he warned that other applicants may not be as accommodating. The majority of residents responding to the city’s public consultation were in favour of the opt-in option. McConkey said in a city of 170,000 residents, 430 responses don’t necessarily portray an appropriate reflection of public opinion. But Giberson argued to the contrary. He praised city staff for “doing their best to get somewhat of a representative” public opinion on the matter. “It’s a clear indicator that people wanted to buy it legally, and conveniently,” he said. Hurst spoke of a “silent majority” of residents who were against stores in Oshawa. Several delegates argued that retail stores offer a much safer venue to buy cannabis. Brent Bell spoke on behalf of Fire and Flower, a cannabis retailer with stores in Alberta and Saskatchewan. At Fire and Flower locations, customers are required to show ID at the door, and people passing the stores cannot see the products. Different from the LCBO, children are not allowed inside the store. Nicole Lasalle represents Aurora Cannabis, a nationwide producer licensed by the federal government. Resident Kyle Langstaff is a medical marijuana user, getting a license after a hockey injury that saw significant damage to the tendons in his foot. He said many other people use cannabis as a way to deal with pain, and having it available locally in retail stores could potentially keep people away from using opioids instead. Local business owner Julian Luke, who has applied for a license, said even if Oshawa chose to opt out, and Whitby, for example, opted in, it wouldn’t make cannabis any less available to city residents. Luke argued the time is now to “put our biases aside”. Sarah Lear said walking away from stores would represent a lost opportunity. “What does the opportunity cost…when you see our newscasts showing hundreds of people lined up in Toronto, hundreds of people lined up in London, and hundreds of people lined up in Sudbury, and our businesses continue to close,” she asked. Fears that people who purchase cannabis at a store immediately consume it in the store or shortly after are unfounded, Lear believes. “It’s not the realistic common consumption practice,” she said. Tom McKeever said council had heard a lot of “arm-twisting” from those who could potentially benefit from retail stores. He said he has had family members who started with smoking marijuana, and eventually moved into harder drugs.